Buying groceries can be expensive these days, especially for families shopping on a tight budget like me and you that need to buy food for our kids and other members of the household. With the economy still puttering along like it is, frugal food shopping advice that can save you money is always good to know. Vons -- a Southern California and Southern Nevada supermarket chain that is a division of Safeway -- acknowledges this enduring consumer struggle. So, to help they've just launched a new program that goes beyond the basic supermarket club card concept model, making it possible for shoppers to save even more on grocery bills. Called Just for U the unique new offering from Vons/Pavilions market chain adds even more value to their Club Card rewards benefits. The results are that store member card holders who are enrolled in this special program save additional money on products custom selected for shoppers based on items they normally buy. This makes it possible to get discounts at the cash register on certain things on your regular shopping list without having to sort through ads, clip paper coupons and to shop at multiple stores around town for maximum savings. 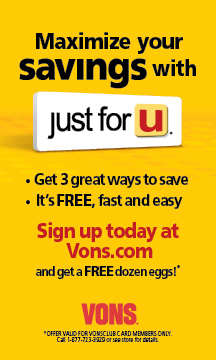 It's simple to opt in to take advantage of the Just for U initiative whether you already have a Vons Club Card or are new to this grocery store. All you have to do is go to Vons.com and follow the prompts to begin getting savings meant just for your unique shopping style and needs. And, as a bonus, if you sign up right now you'll get free eggs. Note that if you are a new Vons customer you'll need to apply for a regular Club Card first, but not to worry, that step takes only a few minutes. The good news is that it gets even sweeter than that. Mommy Blog Expert is giving away several Vons Gift Cards to lucky readers and you're invited to enter to win one! Just leave a comment(s) below this post, Contest ends March 19, 2012 at 12 midnite PST and is open to legal residents of the U.S. only. Two winners, each to receive a $25 Vons GC, will be selected at random from all entries and will be notified via email. FTC Disclosure: Vons/Pavilions provided me with a grocery gift card to facilitate this test and MBE review post and is also providing the prizes and shipping for the giveaway. MommyBlogExpert did not receive any other compensation associated with this post. See complete FTC Disclosure information that appears at the bottom of MommyBlogExpert's main page and at the bottom of every individual post on this blog, including this one. I want to win because I love shopping at Vons. I'd like to win this gift card to help my mom out with groceries since she's retired and on a tight budget. I want to win because I can always use extra money for groceries in my household. i want to win to give it to my Mom. I would love this for my son who would really appreciate it. We shop at Safeway, and would love to win this. I like their meat and produce especially. 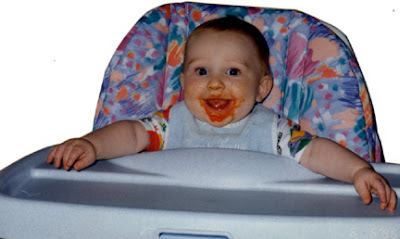 I 'like' MommyBlogExpert on Facebook. I'd love to win to help my grocery budget! I'd like to win because we shop at Safeway(Vons), this would be great for grocery budget. I want to win because $25 can go a long way with grocery shopping. I want to win, because I'd like to save money on groceries. I want to win because I like shopping at Vons. I want to win because I shop at Vons and this would help a great deal. Following Vons_Pavilions via Twitter (@Hotsnotty2), Thanks! I want to win because I could always use grocery money! I'm following MBE on Twitter @getbackzack. I'm following Vons Pavillions on Twitter @getbackzack. I want to win because I could use some extra grocery money. Thanks for the giveaway. I want to win to help pay for groceries as money is tight. I love shopping at Vons! I especially love the fact that they offer home delivery which helps me avoid toting heavy groceries. I'm addicted to diet soda. I need my fix. I need it! Would love to win because they have great prices....thx for the chance! I'd like to win because i've never shopped there before and would like to. I love Vons and I truly enjoy shopping there. It's a beautiful store and very organized. I have a Von's a block away. My mom shopped at Von's when I was a kid, so I have some happy memories there. Will use the giftcard for toiletries.